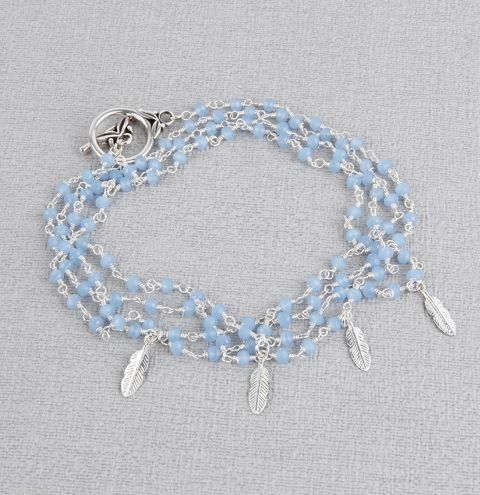 *BLOG FEATURE* Make a delicate bracelet for Spring with blue glass rosary beaded chain and pretty sterling silver feather charms for a boho finish. Measure the chain to your desired length so that it comfortably wraps around your wrist 3 or 4 times, remember to save 2cm for your clasp. Space out the feather charms evenly across the chain every 6 or 7 inches. Wrap the chain around your wrist to check the spacing of your charms. Attach the clasp to either end of the chain with a pair of jumprings.